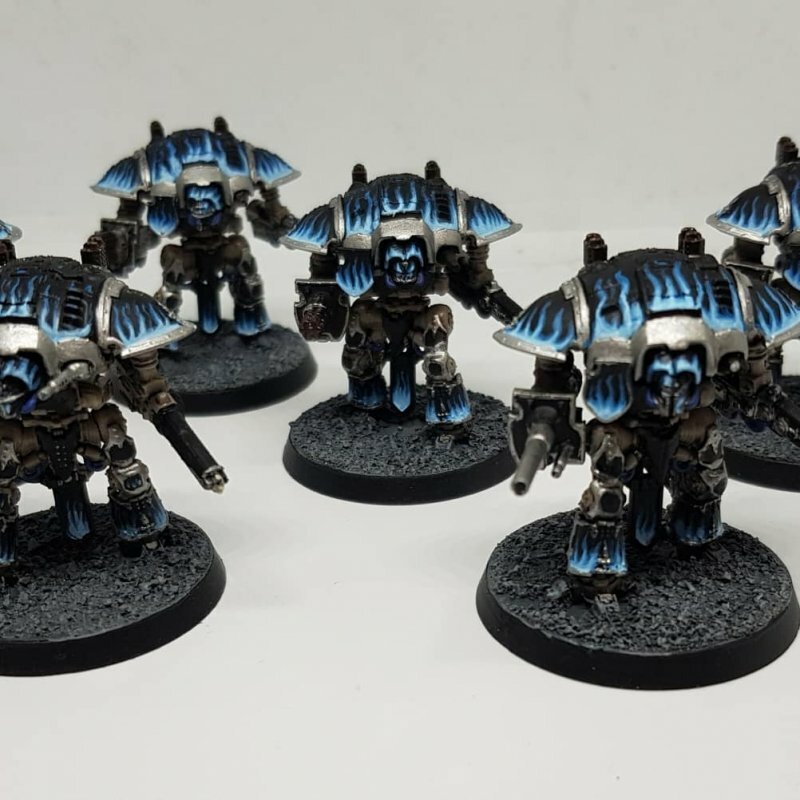 Together, House Adustum and the Legio Surtavora have spun a bloody tale of ice and fire across the skin of history and the ruins of countless cities in their quest to bring the shattered Imperium under the Warmaster's control; for the scions of Adustum are possessed of a cold slow-burning fury that is more than equal to the volcanic incendiary rage of their masters. The story of House Adustum began on the huge high-gravity world of Artica, an unloving cradle of miles thick ice, far from the light of a dying sun and cored through by countless tunnels bored out aeons ago by long extinct beasts. In many caverns, dirty ice gives way to rime-encrusted obsidian, on which strange unsettling and incomprehensible designs have been carved by inhuman hands. In the black places, in the darkest depths of the world towards its frozen core, the servitor races of the beings that once called this world their own fester. Theirs is an endless hunger, a mindless desire for the warmth and meat-stuff of the living that can never be sated. The great families of Artica have had to endure the ever-present threat of spindle-limbed black horrors with clacking beaks, known to them in their distorted and half-remembered dialect of low gothic as the Zahhakari, ever since their colonisation vessel crash landed on the planet, during the Dark Age of Technology; its navigators had been driven mad by ceaseless eldritch piping that haunted their every waking moment. The instant the great ark, Undying Hope, smashed its way through the planet's thin outer crust, a boiling wave of Zahhakari crashed against its torn and violated hull, driven into a frenzy by the painful and unfamiliar warmth of its atmosphere-kissed shell. What few Knight armours had survived the crash were barely equal to the task and over the first few hours of settlement, thousands of screaming men, women and children were dragged into the Stygian darkness, their screams ending only when there was nothing left of them to scream. When the stunned survivors recovered from their shock and started to take stock of their new home, another unwelcome surprise awaited them. While Artica had a rudimentary ecosystem of sorts, with a variety of strange plant-like bioforms sustained in some arcane way by the massive thermal gradients generated by huge crystalline spears in the largest caverns that burn eternally with impossibly cold flames, and silvery quadrupeds that grazed upon this fauna; all endogenous life was completely inedible to human mouths. Using what crude gene lore and equipment that had survived the crash, the settlers engineered a fungus that could nourish itself on the native wildlife and act as their sole form of sustenance. Such a monotonous diet coupled with the struggle to ramp up production before the Undying Hope’s depleted and partially ruined stores were depleted, meant that cannibalism ceased to be held in the horror that it once did. While at first it was reserved for those who had died of natural causes, gradually the surviving families and kin-groups began to prey upon each other, shattering a single state with some centralised authority and replacing it with half-a-dozen warring houses. This coupled with the ever-present threat posed by the Zahhakari forced the early colonists to prioritise the upkeep of their few remaining knight armours. However, the splintered nature of their society and the lack of readily available fuel threated to make this all but impossible – to the point where it seemed that in just a few more generations the last of the mighty machines would fall silent. Fate it seems had other ideas, for Artica had three gifts for its adopted children that were just about to be discovered. Without all three, then it is likely that the people of this frozen blighted world would have been lost to the Zahhakari and their own hungers. The first of the gifts to be discovered was the Field of Bone. Discovered by Shahzadeh Bahadur of House Austum, this was a vast cavern filled with adamantium-hard bones that were on a scale that turned the minds of men, with femurs that rivalled the upper legs of Warlord Battle Titans. Soon knight armours were clad in bone and ivory, freeing up the colonists’ dwindling supply of workable metal for use in delicate and complex mechanisms. The second, found by Bahadur’s son, Shahzadeh Azar, was the Black Sea, an abyssal deposit of promethium so vast that every attempt to measure its dimensions ended in abject failure. The third and final gift had lain in plain sight, requiring only the wit to claim it. It was the savants of House Royâ that realised that the warp-resonate crystals that underpinned Artica’s alien ecology could be fused with the remnants of the Undying Hope’s warp engines to create compact energy cores of immense power, delivering output well in excess of standard Imperial plasma reactor technology. While putting the crystals to such use was initially seen to be blasphemous in the extreme, for by this point, many had begun to worship the eternal flames they generated – flames that would eventually become the basis of House Adustum’s distinctive heraldry. While House Royâ tried valiantly to keep this discovery secret, in time the truth became known to House Audustum, which subsequently attacked and vanquished House Royâ, plundering its secrets and assimilating its scions through forced marriage. Time wrought changes on the flesh and souls of the Articans. Most of those born with the sight never survived childhood, either disappearing in the night or descending into madness, gibbering endlessly about black shapes in the corner of their vision and a great void at the planet’s core that was slowly awaking, the pin-pricks of humans across its cavernous guts forcing it from its deathless slumber. Fate was no kinder to those rare few sensitives that made it to maturity, for the memories of the clans are long and all still speak of the weakness of those touched by the warp and how it has damned them all to harsh bleak lives spent in caverns of impenetrable darkness. The absence of light forced their pupils to grow until their eyes were black orbs, while bleaching their skin corpse-white, while the ommipresent crashing embrace of Artica’s gravity made them squat and stocky, compared to human norm, but less so than the abhuman mining clans that were later to fall to the Tyranid menace. The Scions of Audustum’s fierce marital pride (stemming from the thousands of years that the house has kept the threat of the Zahhakari at bay), initially held firm in the years following Artica’s discovery by the 47th Expedition Fleet (commanded by the Primarch Lorgar Aurelian of the XVIIth Legion), which at that time was supported by elements of Legio Suturvora. However, as the Great Crusade continued, their pride gradually curled into arrogance, spiced with a contempt for those weaker and less harshly tested than themselves. This, coupled with the sermonising of the Word Bearers and the bonds they had forged in the blood of innocents with the Fire Masters during the countless burnings and rushed pacifications that followed in the wake of Lorgar’s censure in the ashes of Monarchia, was the road that led to their decision to bend the knee to Horus Lupercal and in doing so, dam themselves for all time. While much of the accounts of the Betrayal at Calth mention the insane wrath of the Fire Masters, fewer recount the work of House Audustum. Part of the reason for this is the near-pathological thoroughness of its scions. The command to take no survivors and leave no witnesses was in many cases executed to the point that surviving witnesses are few and far between. This phenomenon was made more acute by the sheer destruction that was unleashed during the direct clashes between the Fire Masters and the True Messengers, and the way in which a significant portion of the House’s strength (including the bulk of its knight armiger support) was deployed to attack several of the planet’s arcologies, well before the orbital defence grid was used to poison the Veridian sun. The scions of House Adustum are renowned for its expertise in grinding underground warfare, and such as favours the use of flame, melta, and close combat weapons, which are especially deadly I'm such environments. They are happy to stand and die on their own without complaint, with a stoicism born from generations of unflinching self-sacrifice. They have an Instinctual grasp of target priority, rapidly acquiring target locks on even the fast moving foes at short range. However, they have a weaker grasp of mass-scale above ground tactics. The house's commanders have a marked preference for high density urban battlefields where enemies can be funnelled into kill zones, while the bulk of its sacred knight armies belong to the squatter Questoris pattern knights, as the Cerastus pattern armours are a poor fit for the claustrophobic tunnels of Artica. When on campaign on worlds with open skies, most of the house’s scions spend as much time as possible within their armours, as a means of avoiding the insane emptiness without the comfort of a roof of steel and bone over their heads. Despite this and the ample time that the thrones mechanicum have had to work their influence on the minds of the House’s pilots, their closed blunt souls have made the process painstakingly slow. What protocol and ritual exists revolves around the veneration of living flames, tests of cold weather endurance, the freeze-branding of kill markings upon their flesh and the eating of the heart and eyes of especially esteemed foes. The undisputed rule of House Adustum at the time of the Calth Atrocity was Shah Yazdegerd. The hundred strong Anusiya are the Shah’s elite, sworn to defend their lord to the death. Each wears a precious silvered death mask of purest adamantium. Below the Anusiya are the sparabara (banners in low gothic parlance), which make up the bulk of House Adustum’s fighting strength.